Dornach (Inglis: Dornoch; Scots Gaelic: Dòrnach) is a toun, siesyd resort, an umwhyl Ryal burgh in the Hielands o Scotland. It ligs on the north shore o the Dornoch Firth, naur til whaur it apens intil the Moray Firth til the eist. The toun is athin the Hieland local govrenment cooncil aurie, an athin the umwhyl coontie o Sutherland. The toun is naur the A9 road, ti whilk it is linkit bi the A949 an the B9168. 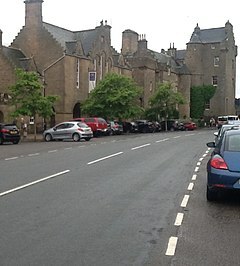 Dornoch haes the thirteent-yeirhunder Dornoch Cathedral, the Auld Toun Jail, an the umwhyl Bishop's Palace whilk is nou the weil-kent hotel, Dornoch Castil an a merkit gowf course, the Royal Dornoch Golf Club, named the 5t best gowf course ootwith the Unitit States in 2005 bi Golf Digest magazine. It is merkit as the last steid a witch wis burnt in Scotland an aa. Hir name wis Janet Horne; she wis tried an duim'd ti daith in 1727. Thar is a stane, the Witch's Stane, commemoratin hir daith, inskribed wi the yeir 1722. Legendarie gowf course desyner Donald Ross began his career as a greenkeeper on the Royal Dornoch links. Dornoch uised ti be jyn'd til the main railwey netwirk at The Mound bi a licht railwey. The railwey wis apen'd on 2 Juin 1902. Stations on the lyn war Dornoch, Embo, Skelbo, Cambusavie Halt an The Mound Junction. Here is the Dornoch Puggie. The stations war shut on 13 Juin 1960. On 21 December 2000, the pop starn Madonna haed hir son Rocco christen'd in Dornoch Cathedral, the day afore her w\ddin ti Guy Ritchie in naurby Skibo Castil. On 13 Januar 2005, Dornoch wis grantit Fairtrade Toun status. Dornoch wis a parliamentary burgh, pit thegither wi Dingwall, Kirkwall, Tain an Wick in the Northren Burghs constituencie o the Houss o Commons o the Parliament o Great Breetain frae 1708 tae 1801 an o the Pairlament o the Unitit Kinrick frae 1801 ti 1918. Cromarty wis eikit til the leet in 1832. The constituencie wis a destrik o burghs an aa kent as Tain Burghs till 1832, an than as Wick Burghs. It wis representit bi ane Member o Parliament. In 1918 the constituencie wis forduin an the Dornoch bit wis mellt intil the than-new coontie constituencie o Caithness an Sutherland. ↑ "Comparative Population Profile: Dornoch Locality". Scotland's Census Results Online. 2001-04-29. Retrieved 2008-09-02. Wikimedia Commons haes media relatit tae Dornach. This page wis last eeditit on 27 Juin 2018, at 15:17.